One of the most coveted places in the world for a climber’s name to end up isn’t in the summit registry of some rare desert tower, or in the latest American Alpine Journal. Rather it’s in Fred Beckey’s “rolodex.” I use quotation marks because this rolodex is actually just a bunch of large cardboard scraps that Fred keeps in the trunk of his car. The cardboard scraps are organized by geographic location of climbing areas, and each one contains a dozen or so hand-scribbled names and phone numbers of vetted climbing partners in those areas. If you find your name on that list, you can expect to receive an out-of-the-blue call from Fred, from a pay-phone, as he rolls through town looking for someone to climb with and, secondarily, for a couch to crash on. Fred Beckey—who always calls himself, simply, Beckey—celebrated his 91st birthday yesterday. There are several remarkable things about Fred. He’s perhaps the most decorated mountaineering first-ascentionist to have ever lived. I’ve never met anyone more committed to the culture, craft and art of climbing and exploration. And he remains as committed to adventure today as he was when he was a teenager and began exploring the Cascades Mountains outside his home in Seattle, Washington. What Fred seems to have in excess is an inexhaustible passion for being outside, climbing every single day. He is living proof that there’s no such thing as being too old to climb, and in fact, if you give it up early, you’ll get older a lot faster. For his 85th birthday a few years ago, there was a big celebration held at the Mountaineers in Seattle. Over 200 people, including myself and Marina, showed up, dressed up in nice pants, shirts and shoes. But Fred was the only guy who showed up with a pair of climbing shoes and a chalk bag, hoping to get some top-roping in on the wall at the facility where the party was being held. Fred’s a living legend in climbing, but his unique, quirky personality contributes as much to his storied stature as the hundreds and hundreds of mountains that he’s been first to stand on top. When you go out to dinner with Fred, you’re going to talk about one of two things: climbing or girls. He has a reputation for being quite the ladies man. But he’s also the quintessential dirtbag, who has probably spent more nights of his 91 years sleeping outside than inside. And when he does sleep inside, it’s usually on a friend’s couch. There’s the classic story of Fred rolling into Tahoe and making plans to crash with our mutual friend Todd Offenbacher. 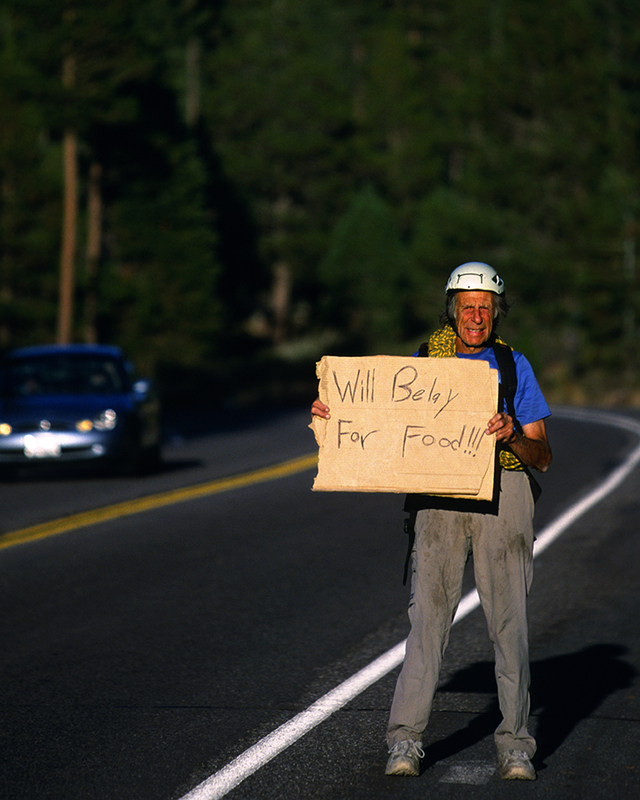 Fred will often endure 12-hour pushes straight from Seattle down to California when climbing conditions are good, often arriving at his destination in the middle of the night. As a rule, he’s always very respectful of his hosts’ homes. On this occasion, he reached Todd’s house at 2 a.m.. Because he didn’t want to wake Todd, he just pulled into the driveway, got out of his car and slept right on the pavement. But that’s just Fred. After spending time with him, I’ve observed that the things we consider conventional are often meaningless to Fred. He just sees the world differently, and it’s always interesting to be around that. Fred is also one of the funniest guys I’ve ever met. One of my favorite things to do is sit around and swap stories with him. He’s sharp and quick-witted. I try to soak in some of that wisdom that only comes from guys who have been on earth this long and have witnessed so much in their time. So when Fred calls, my answer is always Yes. He’d obviously been really thinking about this, probably for the last 12 hours he’d been driving through the night. And the way he described it immediately conjured a very vivid picture in my head. I saw it right away and it struck me, actually, as quite funny. I pictured Fred standing on the side of the road with climbing gear, a rope draped across his torso, a helmet on, and a cardboard sign. I’d called up some friends to let them know that Beckey was in town, and by noon, my house was alive with climbers drinking beers on the back deck—everyone there to just enjoy an unmissable opportunity to be around Fred Beckey. Todd Offenbacher, Chris McNamara, Kevin Swift and Rob Raker were all in attendance. Fred, however, wouldn’t drop the “Will Belay For Food” photo idea. I had no intention of shooting the photo that day, but Fred was so excited he just wouldn’t stop talking about it. Before I knew it, we had all made our way down to Pioneer Trail, about a mile from my house. We placed the props on Fred, styling him out with the rope, helmet and cardboard sign. I started shooting photos, creating the exact picture I’d seen in my head earlier that morning. Meanwhile Rob Raker, a talented filmmaker and climber, stood behind me shooting video. The whole time, multiple cars kept pulling over to ask if Fred needed food or a ride. And Fred absolutely loved it. He explained the whole situation to the drivers by saying, “We’re just doing this because it’s funny!” Then they’d all zip off, seeming a little confused. When I took this photo, I didn’t really understand at the time just how symbolic this portrait would become. 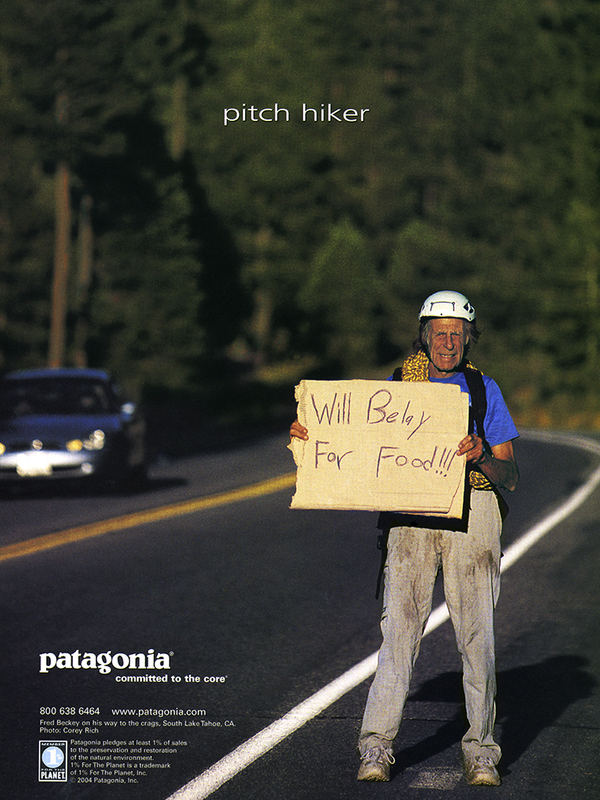 It was published as a Patagonia ad, and numerous other places, and it really seemed to provoke a positive, emotional response in people. Part of that is because Fred really has set the bar for what it means to be dedicated to the climbing life, and this photo captures what Fred represents to the climbing community. But the real reason this photo works is that it goes beyond being just a representation of an abstract ideal; it captures who Fred is genuinely. This was his idea from the get-go. He was the creative director in that sense, the architect behind the whole production. This photo IS Fred Beckey, through and through. A couple years later, I got another call from Fred. He’d since gotten a cell phone, which he kept taped to a string that he wore around his neck. He wanted to know if I was around, and if I wanted to climb. At that point, I had to pretend that my cell phone reception was breaking up because I wasn’t sure if I had 50 more shoots in me. But what’s amazing to me is that Fred has 50 more funny ideas that would surely make people laugh. And that energy and creative spontaneity somehow seems to get richer each and every year. So, cheers to you, Fred Beckey. Happy birthday. I hope that when I’m your age, I’ll still be coming up with great ideas for photography. Wonderful essay Corey! After following Fred around Banff last Autumn trying to get a decent candid photo of him during the film festival I’m amazed to hear that he was so eager to get his picture taken. He was one of the most camera-shy people I’ve ever met! Great story, thanks for the background. There’s somthing up with you’re math at the top, if he was born in 1923, then in 1925 he was 2, not a teenager. This confirms what I’ve long known about Corey. He’s as articulate as he is a great photographer, reminding me of Warren Miller in that regard. Long live Fred, long live Corey! This once again confirms what I’ve long known about Corey. He’s as articulate as he is a great photographer, similar to Warren Miller in his fields. Long live Fred, long live Corey! Touodhcwn! That’s a really cool way of putting it!